Six-year-old mare Montalto, ridden by Carl Spry, won the 2000 meter Alice Springs Cup late this afternoon, in just over two minutes. Locally owned Big Man came second, followed by Spartan Eagle (the winner last year), Moon Devil (like the winner trained by Angela Forster in Port Lincoln) and Whistle Stop. Two of the top five horses were from Darwin. 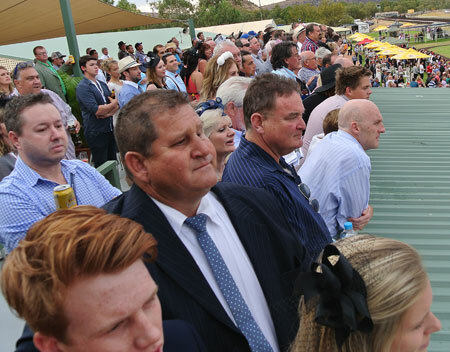 The $110,000 Cup topped an eight-card fixture that attracted a bigger crowd than in the past few years to Pioneer Park, on an overcast and cool but dry day despite some light showers during the night. 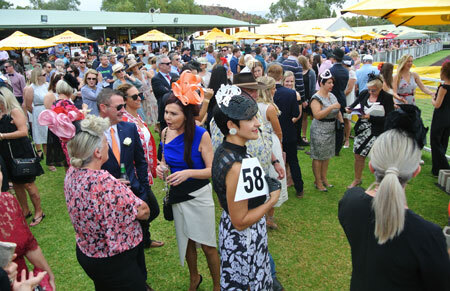 Competition was keen also on the catwalk where the fashions of the field, in various categories, added class to the day. Brigida Stewart (centre) getting ready for the fashions of the field contest • Turf Club chairman Craig Lambley, owner of Big Man, with family members and race goers in the grand stand, watching the Cup • Jill Bourne won the Fascinator class • Jethro Tessman was judged the best dressed man • Kat Cacauas (Contemporary) • Carla Gurney (Classic).